Windmill grass (Chloris truncata) is a native species and is the tenth most common summer weed species in the Western Australian wheatbelt. As a summer weed it hosts pests and diseases and utilises stored soil moisture that would otherwise be available to the following crop. Windmill grass (Chloris truncata) grows as a tufted grass, but any single tuft of grass may consist of a single plant, or several different plants, at different growth stages. The seed heads, consisting of 5-10 branches in a ‘windmill’ shape, break free from the plant. The wind driven seed heads may disperse over considerable distances, until they become entangled in vegetation or along a fence-line. The seeds may begin to shed while the seed head is still attached to the plant and continue to shed once the seed head has broken free. The seeds are 2-3mm long, and have awns that allow the seeds to be trapped in wool or clothing. In the wheatbelt, windmill grass plants predominantly grow as annuals, germinating in response to spring and summer rainfall. However, germination may also occur in autumn or winter, and plants grow as perennials in some regions. Small plants (less than 1g dry biomass, 3-5cm tall) can produce seed heads. A single seed head holds approximately 300-500 seeds. Plant growth and seed head production continues until the plant senesces due to lack of moisture or unfavourable environmental conditions (that is, cold weather in autumn). A single plant can produce approximately 50 seed heads, generating 20-500 seeds per plant. Plant density is usually less than 20 plants per m2. Maximum seed production is approximately 60 000 seeds per m2 and maximum dry biomass production is approximately 1500 kilograms per hectare (kg/ha). 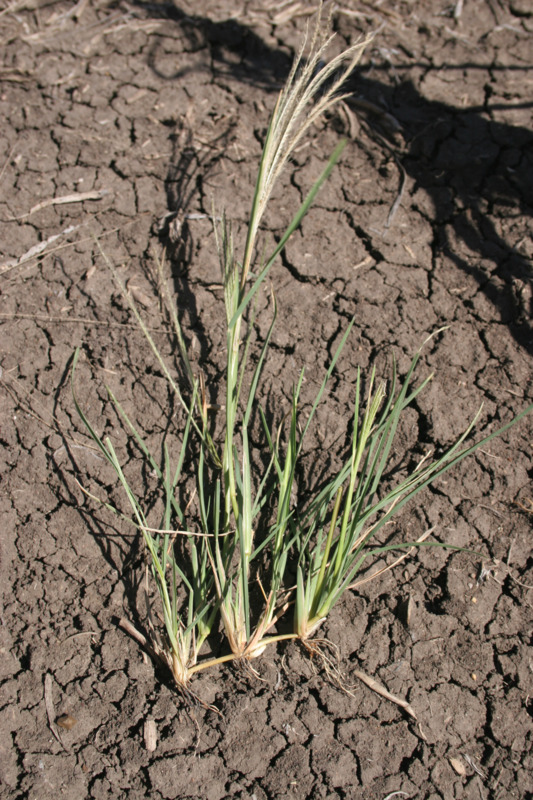 Windmill grass seeds appear to lose viability after three years; however it can flower and set seed at most times of year ensuring a constant supply of new seed. Why is it a weed? As a summer annual weed, windmill grass offers little direct competition with winter crops, but may still reduce crop yield potential. Windmill grass will host crop pests or disease over summer, including aphids and cereal leaf diseases like barley yellow dwarf virus and wheat streak mosaic virus. Summer weeds utilise soil moisture and nutrients over summer/autumn that would otherwise be available to the following winter crop. The extent of the impact summer weeds can have on crop yield will depend on the amount of rainfall over spring and summer, the growing season rainfall available to the crop and soil type. Windmill grass tufts cause an uneven crop seed bed if they are still present in autumn. It is difficult to control in no-till fallows and can reduce the yield of winter crops. It is a prolific seeder and the seed heads blow in the wind, enhancing its spread. 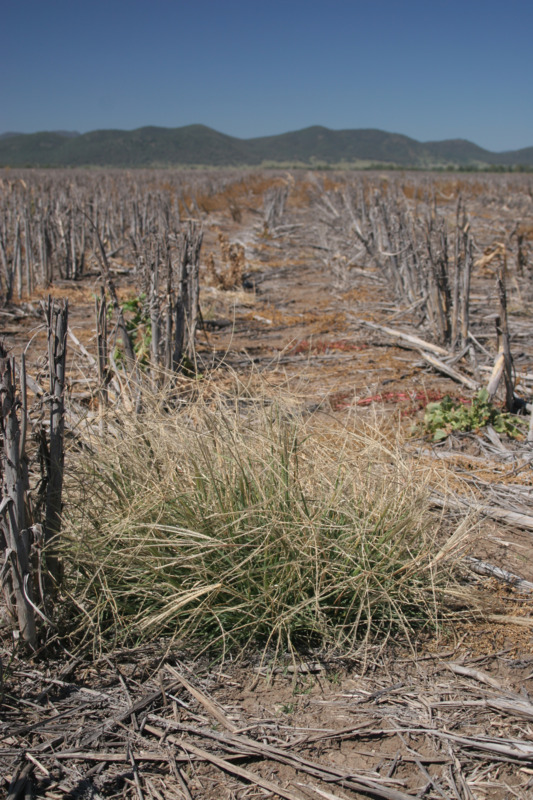 Windmill grass populations have evolved resistance to glyphosate and 11 populations of windmill grass from New South Wales, Victoria and Western Australia have been confirmed resistant to glyphosate.